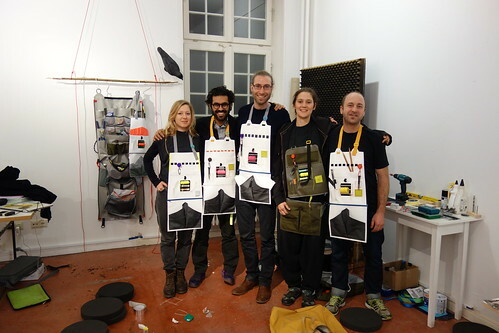 Shoulder bags that transform into aprons, allowing people to hunt and gather material for ideas and then come together to “make” discussion. A shoulder bag intended to be worn as a regular bag, with pouches for foraging, hunting and gathering materials throughout the day. Similarly to how we pick up ideas, collect thoughts, take notes, this bag is a storage container for material ideas. When the maker discussor enters into a discussion, the bag can be transformed into a tool-apron, a work uniform, a discussion costume. The pouches containing the foraged materials are easily accessible and the rest of the apron contains a selection of tools that can be used for working these materials, manipulating them and producing discussion. Making Discussion comes from a desire to be able to use my hands to manipulate matter in order to engage in discussions. Not discussion about the form and function of what is being created, but philosophical, political discussions about abstract topics. In particular I was interested in real-time discussions/conversations that normally take place in spoken language, in shared physical space.